This cauliflower is ceramic. I remembered I had this photo and chose to use it instead of one of a real cauliflower. It was one of the many beautiful decorative objects in Le Pont De L’Ouysse Restaurant in the countryside of Lacave, not far from Rocamadour, in the Lot, South West of France. 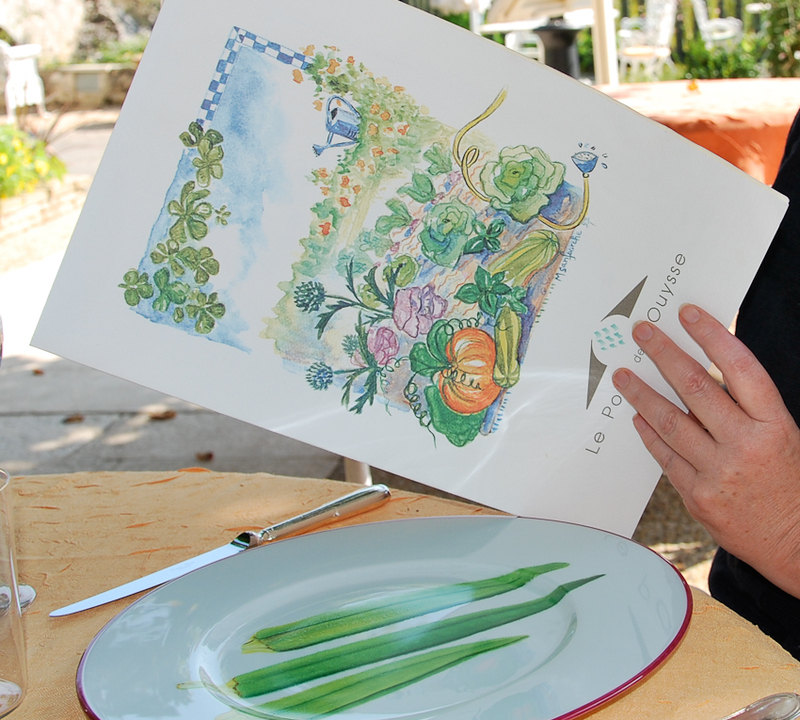 The restaurant is recommended in Stephanie Alexander’s Cooking & Travelling in the South-West France. I stayed with my partner and two friends in the same converted barn – La Vieille Grange in Mercadiol , a small hamlet in the South West of France. And all this to tell you about olive Tapenade which I love to eat with steamed cauliflower. Tapenade made from black olives, mustard, anchovies, capers (some use brandy) comes from Languedoc, further south than the Lot, but the olive tapenade I prefer is from Provence. It is fresh and light and very summery. In the Occitan region in the south of France (Occitan –romance language spoken in southern France), the word for capers is tapéno, hence the name for this popular spread. I present it with bread but sometimes I accompany it with some vegetable crudities. Raw or steamed cauliflower flowerets are a pleasant addition. But Tapenade also comes in very handy as a sauce or condiment for simply cooked fish or vegetables, especially steamed cauliflower. Tapenade is a pesto and traditionally made with a mortar and pestle. I cut my herbs by hand (otherwise they can taste grassy) and then add them to the olives that I have chopped in the food processor. I also need to give credit to y friend Liz who introduced me to Tapenade as made in Provence, many years ago. I do not weigh/measure ingredients when I make this but the following works. Place olives crushed garlic in a food processor and chop to a medium grind (I do not like it too smooth). Cut all the herbs and add them to the olives, add oil lemon and pepper. Blend again for 5 seconds to mix the ingredients. Place the tapenade in a sterile jar and cover it with a thin layer of olive oil – keep it in the refrigerator for up to two weeks. It comes in very handy!! Affogato means drowned or smothered or choked in Italian, and which ever way you look at it, in this recipe the cauliflower has been killed off in red wine. The cauliflower is cut into thin slices and assembled in layers: cauliflower, sprinkled with a layer of slivers of pecorino, thinly sliced onion and anchovies. Some recipes also include stoned black olives. Although the coloured cauliflowers or broccoli can also be used for this recipe, I like the white cauliflower because it becomes rose- tinted by the red wine. I compress the assembled ingredients, cover it with a circle of baking paper, an ovenproof plate and then put a weight on top (see photo). 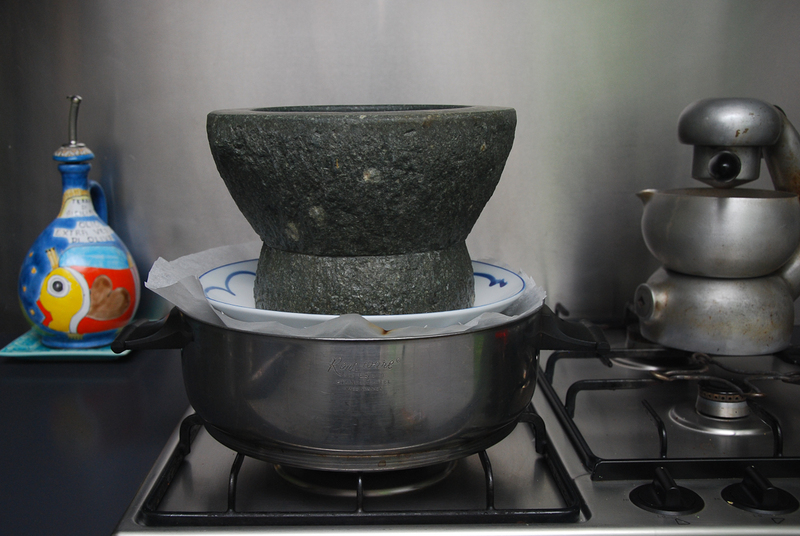 It is cooked slowly until all the liquid evaporates and then it can be turned out and sliced like a cake. You may also like to use a non- stick saucepan or as I often do, place a circle of baking paper at the bottom of the pan to ensure that the “cake” does not stick to the bottom. Many recipes add water as the cauliflower is cooking to prevent it from burning, but if you cook it on very gentle heat and in a good quality saucepan with a heavy base, it may not be necessary. 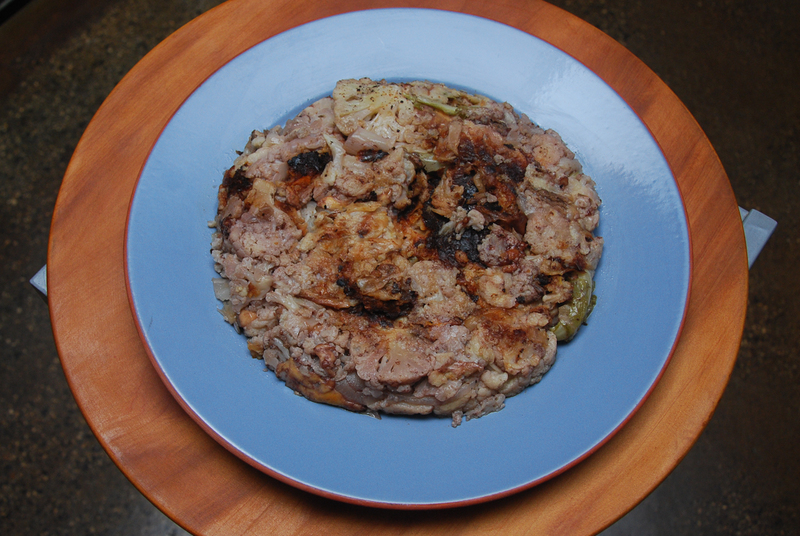 VRUOCCULI AFFUCATI are especially suitable as an accompaniment to a strong tasting dish. Usually it is presented at room temperature or cold (I can remember the left over cauliflower being particularly satisfying as a stuffing for a panino). Place some olive oil in a deep saucepan (the ingredients are layered). Add a layer of the cauliflower. 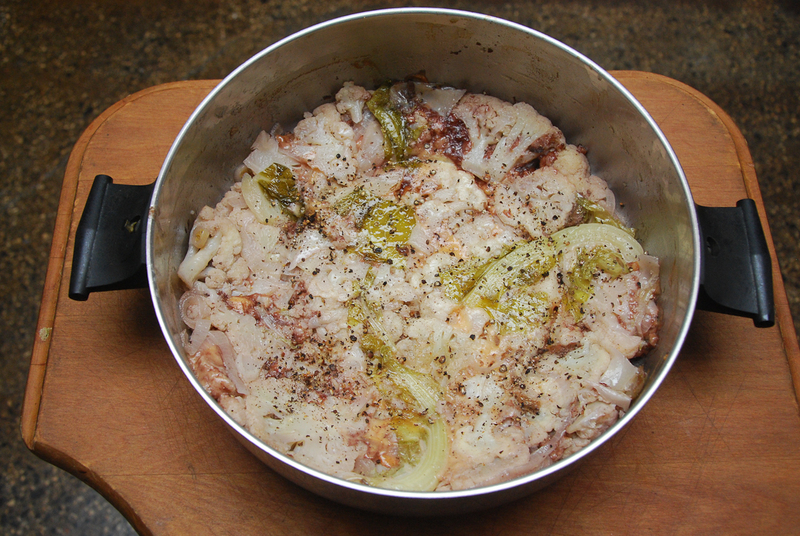 Top with the pecorino cheese, anchovies, ground pepper and onion slices (salt to taste). Add another layer of the cauliflower and more oil. Continue with more layers but finish off with a layer of cauliflower on top. Press down the layers with your hands. Top with more oil and add the wine. Cover the contents first with either a piece of baking paper or foil cut to size and slightly loose. Put a weight on the top so as to keep all of the layers compressed (see above). There should e a gap around the weight and the saucepan to allow the steam to escape. Cook on very slow heat for about 40-60 minutes and when the liquid has evaporated, you should also hear the cauliflower sizzle in the oil.